Genuine Agate Stone. 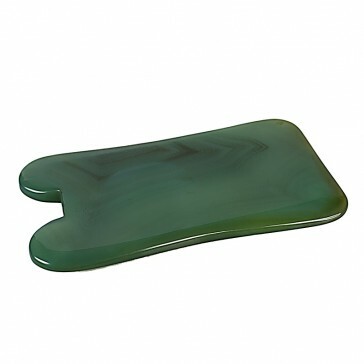 This agate Gua Sha tool is good for deep effective work and is rectangular shaped which gives the user choice of delivering either a narrow or broad stroke area. This Gua Sha tool has a channel shaped end which is useful in straddling underlying narrow skeletal structures such as the Tibia, Radius of the arm, superior areas of the spine, the medial end of the scapular and even fingers. Agate is said to have metaphysical properties of balancing yin & Yang, harmonizing, cleansing and stabilizing qualities of the aura and can remove blockages from every chakra. Gua Sha revitalizes, rejuvenates, helps diminish stress, fatigue and severe exhaustion. It helps to release emotions, relaxes the body and helps to clear the mind and senses. Gua Sha is a simple treatment, but incredibly effective for many ailments which is why it has been used in China and South East Asia for thousands of years. Colours of the stone may vary slightly.